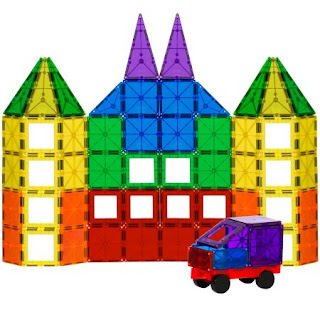 Snag these Best Choice Products 100-Piece Clear Multi Colors Magnetic Tiles Educational STEM Toy Building Set w/ Car &amp; Carrying Bag for ONLY $44.99 (Retail $129.99). Learn to have fun and have fun learning! This 100-piece set of magnetic building tiles are perfect for developing children's creativity! Build tall towers and all sorts of cool structures with this set, designed to stimulate imagination, develop problem-solving and motor skills, and help teach shape recognition. Entertainment just got a lot more educational!